Vladimir Kramnik is out of the running to win an 11th Dortmund title after crashing to a second straight defeat, this time against Anish Giri. We also know that Radek Wojtaszek won’t defend his title and Liviu-Dieter Nisipeanu will finish last, but otherwise everything’s up for grabs. Ian Nepomniachtchi goes into the final round with a half-point lead after a great escape against Jan-Krzysztof Duda, but Duda, Giri, Meier and Kovalev can all win the tournament if Nepo doesn’t win his last-round game. 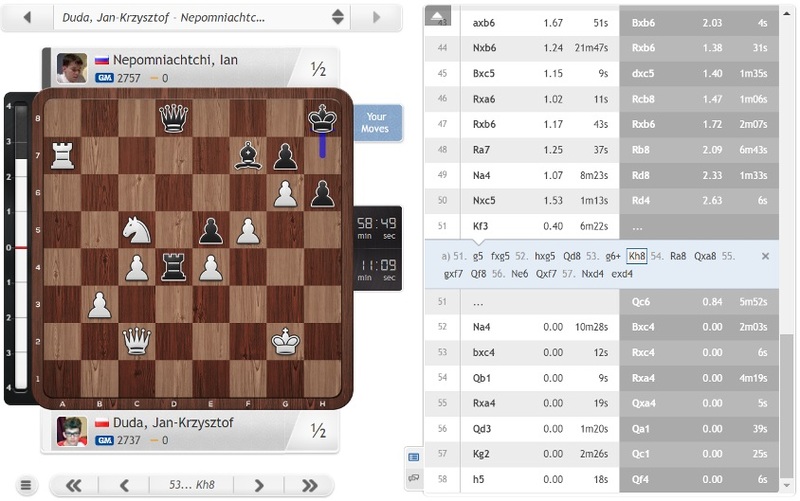 The key game for the overall outcome of the tournament was expected to be Duda-Nepomniachtchi, and it didn’t disappoint. 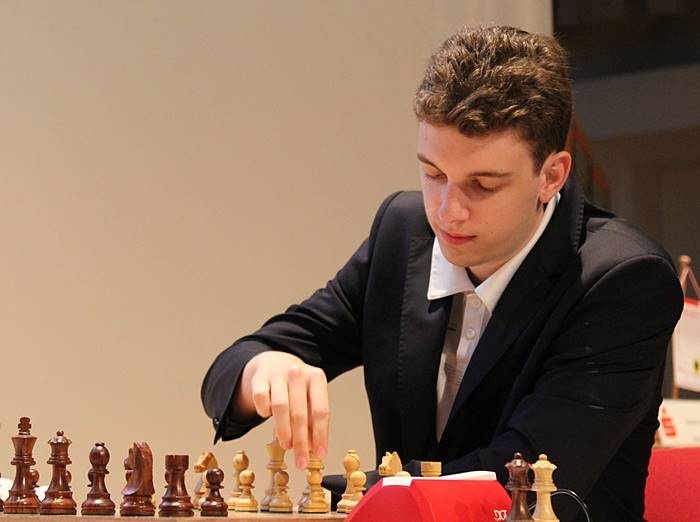 In a 3.Bb5 Sicilian sole leader Ian Nepomniachtchi found himself gradually outplayed, with 20-year-old Jan-Krzysztof Duda taking full control of the d5-square and then methodically dismantling the black queenside. 52…Bxc4! 53.bxc4 Rxc4 54.Qb1 Rxa4 55.Rxa4 Qxa4 and White’s queenside pawns had gone, with a draw agreed shortly afterwards. 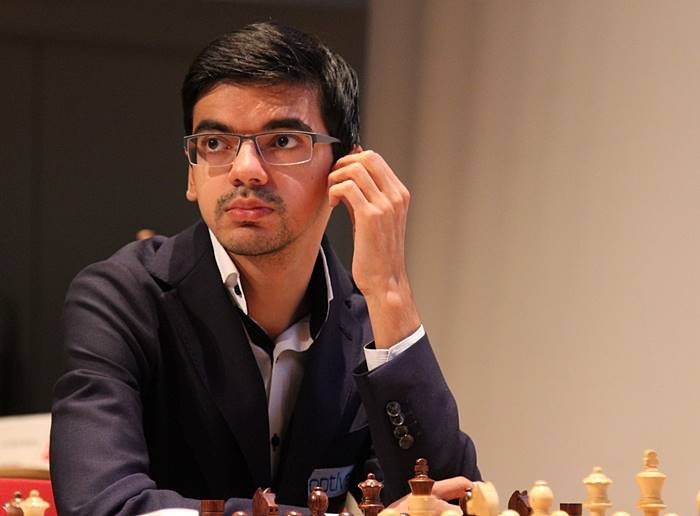 That meant that instead of leap-frogging ahead of his opponent Duda remained half a point behind, where he was joined by three more players, including Anish Giri. 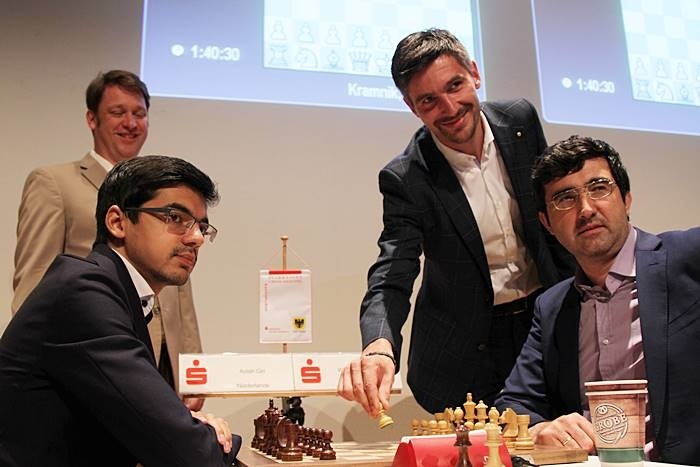 Giri’s opponent was Vladimir Kramnik, who, after his loss the day before, could be relied upon to play only for the win he needed to stay in contention for first place. White may be a pawn down, but the threat is g4, Ne5 and Rcd1, winning material if Black doesn’t react fast. After 13 minutes Giri decided to give up a pawn to simplify the situation with 27…e5! ?, and after 28.Nxe5 Rd4 29.Rf3 Nh4 30.Re3 Nf5 now was the time another player might simply have played 31.Rf3, when a logical draw by repetition would most likely have followed. Kramnik was in no hurry to resign, but by move 59 the black a-pawn had reached a2, and five moves later he finally conceded defeat. That meant that after a 7 losses, no wins record against Kramnik before this year Giri has now won two games in a row against his former nemesis. Giri is also now only 0.2 points behind 5th place Kramnik on the live rating list, while Ding Liren in 4th suddenly has a 16-point advantage over Kramnik. 20.Nxc7! Bxa4 21.Rxd6 Nxd6 22.Nxd6 Ra7 23.Nc4 left White with the favourable imbalance of two minor pieces for a rook, with Black’s doubled extra pawn counting for little. Meier went on to convert his advantage with impressive technique. Wojtaszek-Kovalev ended in a draw and provided confirmation that Radek Wojtaszek wouldn’t be defending his Dortmund title. In this particular game he came close to a win, but a couple of imprecise moves saw a significant positional advantage fade away. The simple scenario is of course if Nepomniachtchi beats Meier with the white pieces, when he wins the tournament outright. If he draws or loses, though, it gets a lot more complicated. There are no playoffs and the first tiebreaker is “most games with Black” (good for Meier, Giri and Kovalev but not Nepo or Duda), followed by “most wins” (good for Giri or Duda if they win in the last round). All the players have a mathematical chance, while for instance Giri knows that if he beats Duda only a win for Nepomniachtchi can stop him winning his first supertournament. Don’t miss all the action starting two hours earlier at 13:15 on Sunday live here on chess24!